When one medicine is advertised as being more effective than another, the Court examines the scientific studies to decide if they support the advertised claims sufficiently to comply with the consumer law provisions concerning false and misleading advertising. The Federal Court of Australia was in this position in in GlaxcoSmithKline Australia Pty Ltd v Reckitt Benckiser (Australia) Pty Limited (No 2)  FCA 1 (Foster J) (8 January 2018). Nurofen, which is pain relief medication marketed and sold by Reckitt. The active ingredient is ibuprofen. The standard dose is 400 mg.
Panadol, which is pain relief medication marketed and sold by Glaxco (GSK). The active ingredient is paracetamol, also known as acetaminophen. The standard dose is 1000 mg. In this article we examine the advertising, the pain relief market, the law of comparative advertising, the scientific knowledge and the outcome. Commencing in August 2015, Reckitt undertook an advertising campaign to promote Nurofen as better than Paracetamol. It ceased in December 2015, pending the outcome of the proceedings. The campaign comprised mass-market advertising through many channels: a television commercial, print advertising in magazines purchased by a broad cross-section of the public, print advertising in supermarket catalogues, point-of-sale advertising in retail outlets and outdoor advertising on billboards and at bus stops and train stations, and trade advertising directed to pharmacists. 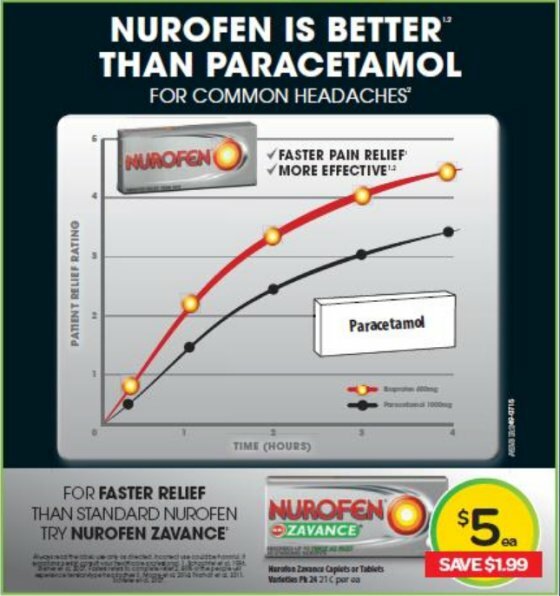 In some advertising, the heading was: NUROFEN IS BETTER THAN PARACETAMOL; in other advertising it was: NUROFEN IS SUPERIOR TO PARACETAMOL. In some advertising, FOR COMMON HEADACHES appeared below the heading; in other advertising, FOR TENSION-TYPE HEADACHES appeared below the heading. In some advertising, plain white packaging labelled Paracetamol was depicted as the comparison medicine; in other advertising, a packet of Panadol in its distinctive green and white packaging was depicted. Always read the label, use only as directed. Incorrect use could be harmful. If symptoms persist, consult your healthcare professional. 1. Schachtel et el, 1996, Steiner et al, 2007, Faster refers to complete relief 2. 80% of the people will experience tension-type headaches 3. Moore et al, 2014, Norholt et al, 2011, Schleier et al, 2007. The graph was reproduced from the Schachtel Study. The overall impression, particularly the graph with its bright red line for Nurofen and 4 hour time frame, was that Nurofen delivers faster and more effective relief from pain caused by common headaches than does Panadol or paracetamol. Panadol has a long heritage – it has been supplied by Glaxco in Australia since 1959. Each year, the manufacturing plant at Glaxco produces more than 50 million packs of Panadol. In the 12 months ending 23 August 2015, the total value of the over-the-counter (OTC) pain relief market in Australia was $580.54 million. At that time, that total market share was not split between Panadol and Nurofen 50/50 but was split in a ratio of approximately 46% to 54%. Both Nurofen and Panadol products are sold in different formats (as tablets, capsules and caplets), in different sub-brands and formulations, and in different packaging. The standard products are distributed through supermarkets, petrol stations and convenience stores. The stronger pain management products are distributed through pharmacies. The OTC pain relief category is the largest consumer health care category serviced by Glaxco. These facts provide the commercial reason for bringing the proceedings. Was there an adequate foundation in scientific knowledge to support the claims made? If so, there are reasonable grounds to make the claims. If not, the claims are false. Reckitt relied primarily upon the Schachtel Study, which was a single clinical study. It was conducted in 1996 and established statistically significant superiority in terms of speed and efficacy of treatment for ibuprofen over paracetamol. The graph was sourced from the study. The results were not replicated in two further studies designed to compare the speed and efficacy of treatment as between ibuprofen and paracetamol with respect to pain free relief at two hours after dosage. Both parties relied upon expert evidence to advance their cases. The experts relied upon the Cochrane Collaboration, which is a source of high-quality information about the effectiveness of health care. Both experts agreed that the Cochrane meta-analyses based on the application of scientific and arithmetical computer programs are a gold standard for evaluating and comparing medication efficacy (and safety) and are more informative than single clinical trials as they synthesise the results from all relevant studies. The Cochrane meta-analyses (2015 & 2016) concluded that ‘no claim of superiority could justifiably be made by ibuprofen over paracetamol in the present state of scientific knowledge’. Therefore Glaxco succeeded in stopping the Reckitt advertising campaign. Glaxco will not ask for corrective advertising. It will ask for damages or compensation at a hearing to be held at a future date. It is interesting to observe that the consumer regulator, the ACCC, did not intervene in this dispute. The ACCC left it to Glaxco to protect the consumer from the false and misleading advertising, no doubt relying upon an alignment of the public interest and Glaxco’s private interest.